Romney issues over-the-top attack on embassy attacks… And his statement looks worse and worse as new information comes out, including the death of the U.S. ambassador to Libya… Romney camp stands by its attack saying embassy statement came after the u nrest began… More tensions between Obama and Netanyahu… Focusing on Florida… Obama camp goes on the air in Wisconsin… Team Romney again outspending Team Obama on the airwaves this week… And this week’s 10 hottest TV markets. A day that started with a campaign pause for solemn remembrances of 9/11 ended with violence abroad and mudslinging here in America. The Daily Rundown's Chuck Todd reports. *** Over the top : Yesterday we noted that Mitt Romney, down in the polls after the convention, was throwing the kitchen sink at President Obama. Little did we know the kitchen sink would include -- on the anniversary of 9/11 -- one of the most over-the-top and (it turns out) incorrect attacks of the general-election campaign . Last night after 10:00 pm ET, Romney released a statement on the attacks on the U.S. embassies in Egypt and Libya. After saying he was “outraged” by these attacks and the death of an American consulate worker, Romney said, “It's disgraceful that the Obama administration's first response was not to condemn attacks on our diplomatic missions, but to sympathize with those who waged the attacks.” Yet after learning every piece of new information about those attacks, the Romney statement looks worse and worse -- and simply off-key. First, Romney was referring to a statement that the U.S. embassy in Egypt issued condemning the “efforts by misguided individuals to hurt the religious feelings of Muslims.” But that embassy statement, which the White House has distanced itself from, was in reference to an anti-Islam movie and anti-Islam pastor Terry Jones, and it came out BEFORE the embassy attacks began. Then this morning, we learned that the U.S. ambassador to Libya, Chris Stevens, and others died in one of the attacks. Republican presidential candidate Mitt Romney addresses the crowd at the 134th National Guard Association Convention at the Reno-Sparks Convention Center, September 11, 2012 in Reno, Nevada. *** When news-cycle campaigning goes awry: Bottom line: This was news-cycle campaigning by the Romney campaign gone awry. 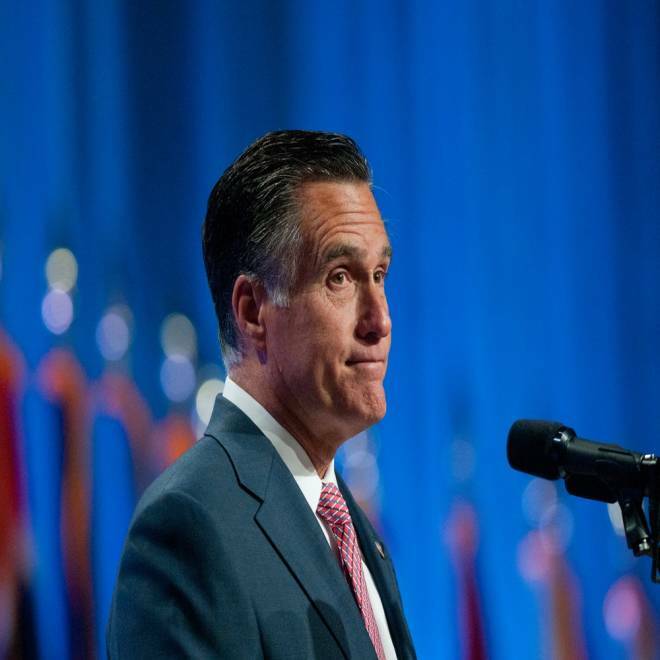 Why didn’t the Romney campaign wait until it had all the facts? On his overseas trip in the summer, Romney was so careful not to criticize Obama while on foreign soil. But how much time do you give an administration to work through a diplomatic and international crisis before trying to score immediate political points? You’d expect the Sarah Palins of the world to quickly pounce on something like this, and she predictably did. But a presidential nominee running for the highest office in the land? After the facts have come out, last night’s Romney statement only feeds the narrative that his campaign is desperate. And given that the Romney camp has already moved on to other subjects this morning -- issuing a press release on debt and not the embassy attacks -- it appears the campaign realizes it, too. Right before our publication time, the Romney camp responds to us that it stands by its statement from last night. The controversial embassy statement, the Romney camp argues, had occurred AFTER the unrest in Egypt and Libya had already begun (citing this CBS report) and that the statement had served as the administration’s sole response until about 10:00 pm ET. *** More tensions between Obama and Netanyahu: In another sign that foreign affairs and national security have jumped to the top of the issues in the past day, there’s renewed tension between Israel PM Netanyahu and the Obama White House over Iran. The New York Times: “Prime Minister Benjamin Netanyahu of Israel inserted himself into the most contentious foreign policy issue of the American presidential campaign on Tuesday, criticizing the Obama administration for refusing to set clear ‘red lines’ on Iran’s nuclear progress that would prompt the United States to undertake a military strike.” Then came a dispute over whether or not Obama was snubbing Netanyahu by not meeting with him when he comes to the U.S. later this month. In the evening, the White House released a statement saying that Obama and Netanyahu had talked by phone for an hour and adding: “Contrary to reports in the press, there was never a request for Prime Minister Netanyahu to meet with President Obama in Washington, nor was a request for a meeting ever denied.” The Israelis have another version of this phone call and still believe they have been snubbed by not getting that invite. By the way, don’t think Israeli political leaders are united on this. Check out the headline over lead story in the Jerusalem Post: “Mofaz to PM: Are you trying to oust Obama or Ahmadinejad? *** Focusing on Florida: Today, most of the campaign activity is in Florida, with Romney holding an event in Jacksonville at 9:30 am ET and with Bill Clinton stumping in Orlando at 6:30 pm (after stopping in Miami yesterday). Here is where things stand in Florida right now: It is a must-win state for Romney, and it’s a luxury for Obama -- which could be a knockout blow in this contest if he wins it. Why? According to our battleground map, if Obama wins Florida and just one other toss-up state -- but loses every other one -- he hits or surpasses 270 electoral votes. In other campaign news today, Obama holds an event in Las Vegas at 8:25 pm ET (and conducts an interview with Telemundo). *** Obama camp goes on the air in Wisconsin: But this map news has to make the Romney campaign smile: The Obama camp is now advertising in Wisconsin, purchasing $670,000 of airtime in the state from Sept 13-19 to match (and exceed) the Romney advertising there. While we’ve had Wisconsin as “toss up” on our battleground map for months, we’ve told you that we’d know if the state were TRULY competitive if both sides were advertising there. Well, now we know… Speaking of TV ads, the Obama camp has this new one that revives its charge that Romney’s tax plan would end up raising taxes on the middle class. And the Romney camp has a new Spanish-language one hitting Obama on Medicare. *** Team Romney again outspending Team Obama: This week – from Sept. 10-16 –Team Romney (the campaign and outside groups) is outspending Team Obama (campaign and outside groups), $10.7 million to $9.4 million. Here’s the breakdown: Obama camp $7 million, Romney camp $6.9 million, American Crossroads $2.7 million, Priorities USA $2.1 million, Americans for Prosperity $1 million, and SEIU/Priorities $240K. Note: These numbers are a bit smaller than in past weeks because the campaigns pulled down their ads on Sept. 11.